Miguel Cabrera hits an RBI single in the third inning against the Chicago White Sox. He slaps the ball around and gets on base, and Miguel Cabrera hits the ball 500 feet. Things were little backward Thursday. 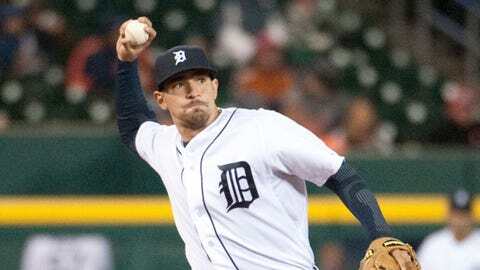 Davis came within a few feet of his second career two-homer game, Cabrera drove in three runs with a pair of well-placed ground balls, and the Tigers went on to a 7-4 victory over the White Sox. After spending two seasons playing left field, Castellanos is showing steady improvement as a third baseman. Davis cleared the Tigers’ bullpen with a solo homer in the fifth, then rattled the same fence with an RBI double in the eighth. "How about that?" he asked, jokingly puffing out his chest. "I don’t have many days like this, but I had a big one today. I thought I was going to get that second one, but this is a really big ballpark." Cabrera showed off the skills that have won him three straight American League batting titles. In the third inning, he grounded an RBI single in the hole between first and second, then — facing a different alignment in the seventh — he drilled a two-run base hit up the middle. For Cabrera, finding gaps with grounders seems just as easy as getting up in the morning. "I’m just trying to hit the ball into a hole," he said. "You have to be able to use the bat to hit the pitch where they give you room." To people who don’t have career .320 batting averages, it isn’t quite that simple. "He makes everything look so easy," Davis said, shaking his head. "It isn’t easy, but I guess that’s why he has three batting championships and a Triple Crown, even though he plays in this park. He can do those things that the rest of us can’t." Cabrera’s talent is so great that the Tigers can’t even pretend to worry about his slow start. Even with the two singles, he’s hitting only .250 after 19 games. "I know that everyone wants us to say that we’re happy that he’s starting to hit, but come on — we all knew he was going to hit," said Max Scherzer, who rode the offense to his second victory of the season. "He’s the best hitter in baseball, and that hasn’t changed. "When other guys do things, we’re happy for him. But to be honest, we just expect Miggy to do it. That’s just how he is." Both of Cabrera’s hits came with two out. Normally, that’s a situation that favors the defense, but White Sox manager Robin Ventura agreed that normal baseball odds don’t matter when he’s at the plate. "Facing that guy in that situation is one of the least appealing things in baseball," Ventura said. "He can beat you with a grounder into the hole or he can hit one 500 feet. That’s tough to stop." To make things worse for Ventura and his banged-up roster, they were facing Scherzer on one of his good days. An elevated pitch count limited him to six innings, but he still struck out 10 batters and allowed just two runs. "There’s a reason he’s the Cy Young winner," Chicago slugger Adam Dunn said. "You go against Verlander one night and then you have to go against Scherzer, and they are both just so tough. They have so many pitches that they can throw for strikes that you are always in trouble against them." It was the ninth time in his career that Scherzer struck out at least 10 batters while pitching six or fewer innings, moving him into a six-way tie for the third-most in major-league history. Only Randy Johnson (18) and Nolan Ryan (14) have done it more often. "I was feeling great today," Scherzer said. "The White Sox always put up a lot of quality at-bats against me, and they drove my pitch count up by fouling off a lot of pitches. But I always felt like I had something to fall back on and get a strikeout when I needed one. "Kudos to me, and kudos to the offense for giving me so many runs." The Tigers now leave for an eight-game, 10-day road trip to Minnesota, Chicago and Kansas City before returning home on May 5 to play the Houston Astros. During the game, the team announced that they will honor their former manager, Jim Leyland, before the game against the Twins on May 10, with a pregame ceremony that will include him throwing out the first pitch.